This TPI CF-20 commercial workstation floor fan has powder-coated steel guards, a 7' power cord, and three speed settings for different ventilation in commercial environments. The 120V floor fan has an open-ventilated, single-phase 1/5HP motor with a self-lubricating sleeve bearing for minimal maintenance. The fan has three speed settings: low speed moves air at a rate of 2,950 cubic feet per minute (CFM), medium speed at 3,100 CFM, and high speed at 3,450 CFM. A rotary switch changes the fan's speed and turns the fan on and off. The floor fan comes with a 7' stranded junior thermoplastic (SJT) type 3 conductor cable with a three-prong plug for connecting to grounded electrical outlets. The floor fan has an aluminum three-paddle blade that is lightweight and resists corrosion and tarnishing, and a steel V-shaped stand that is ductile and rust resistance. Powder-coated steel guards are held together with retaining clips to help prevent objects from coming into contact with the blade. An adjustable tilt directs airflow at higher or lower angles. This fan comes with a one-year manufacturer's warranty for defective parts and workmanship, and it meets Underwriters Laboratories (UL) and federal Occupational Safety and Health Administration (OSHA) standards for quality assurance. 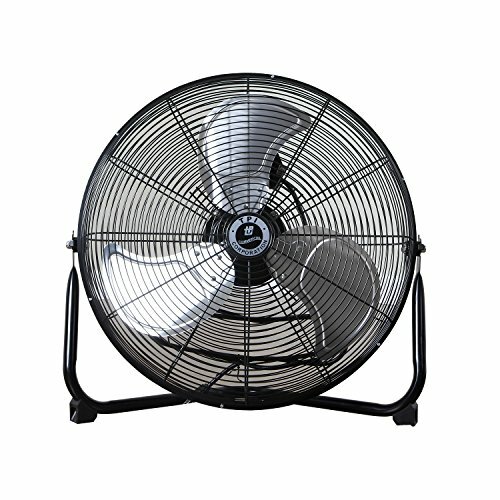 The floor fan is suitable for use in gyms, warehouses, and garages, among other commercial environments. TPI Corporation manufactures industrial and commercial electrical heaters, process heat ovens, ventilation products and fans, lighting equipment, and thermostatic controls. The company, founded in 1950, is headquartered in Johnson City, TN. View More In Floor Fans. If you have any questions about this product by TPI, contact us by completing and submitting the form below. If you are looking for a specif part number, please include it with your message.